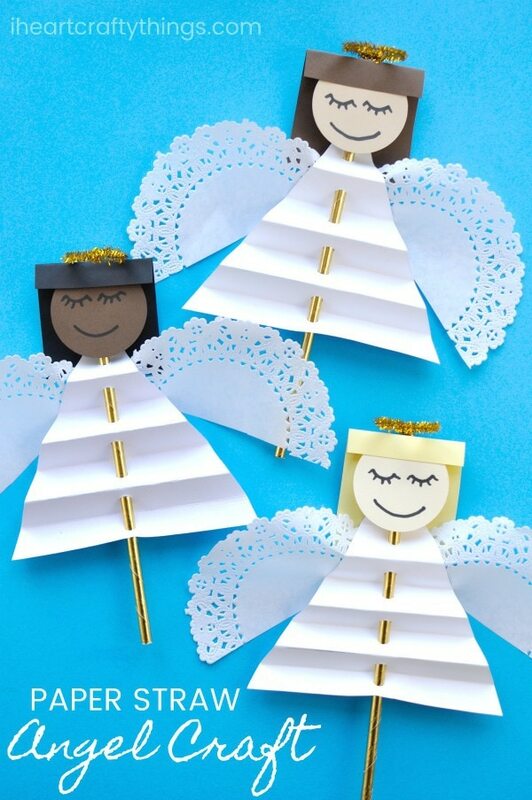 Christmas angel crafts are among our favorite every year during the holiday season. Whether you make them to go along with a Sunday school lesson about Christmas or as a lovely Christmas decoration, they are such a joy to have around the house. This beautiful Christmas angel craft for kids we are sharing today is gorgeous and couples as a puppet kids can play with after creating it. I especially love how children can customize the skin and hair of their darling Christmas angel craft! Christmas Angel Craft template <—-DOWNLOAD THE TEMPLATE HERE! 1. Gather your supplies. Print out the Christmas angel craft template on white cardstock. Accordion fold the angel body template and then punch a hole in the middle of the folded template. 2. 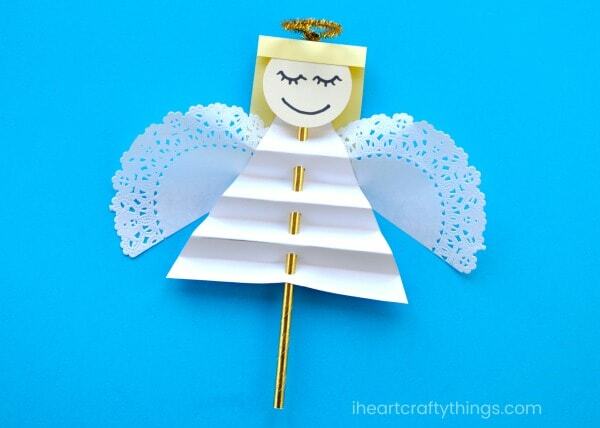 Unfold the angel craft body template and slide your gold paper straw through the holes in it. Leave about 3/4-inch at the top for room for your angel face. 3. Cut your 5-inch white paper doily in half. Add glue on the back of the angel body where you would like to place your wings and glue the paper doily wings onto the back of the angel. 4. 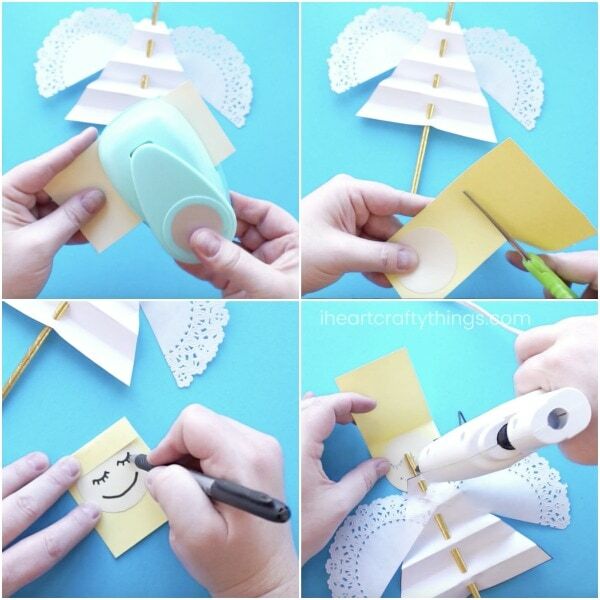 Use your 2-inch circle punch to punch out an angel face from your colored cardstock. Now cut out a rectangle for your angel hair. Fold down a small section at the top of the rectangle hair to make bangs. Add glue to the underside of the bangs and glue the face onto the bangs. 5. Grab your black marker to add details to your angel face like eyes and a mouth. 6. 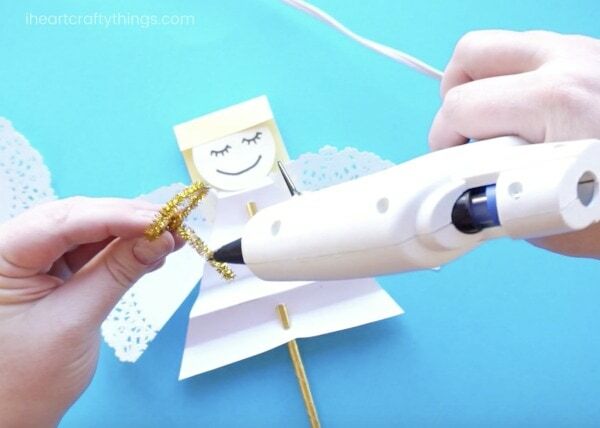 Heat up your hot glue gun. Add a line of glue at the top of the gold paper straw to glue the face onto the paper straw. Then add glue to the back of the paper straw to glue the hair to the back of the straw. 7. Bend the end of your gold shimmer stick into a circle halo. Twist the end of the circle around the remaining section of shimmer stick to close the hole. Bend down the shimmer stick to form your angel halo and cut off any excess from your gold shimmer stick. Add glue to the back of the halo and glue it onto the back of your Christmas angel craft. Your Christmas Angel Craft is complete! Isn’t it gorgeous?! 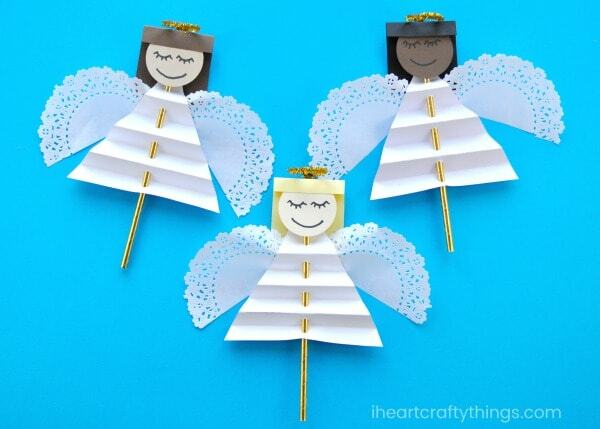 The excess gold paper straw at the bottom of your Christmas angel craft makes it great to hold and use for a puppet. 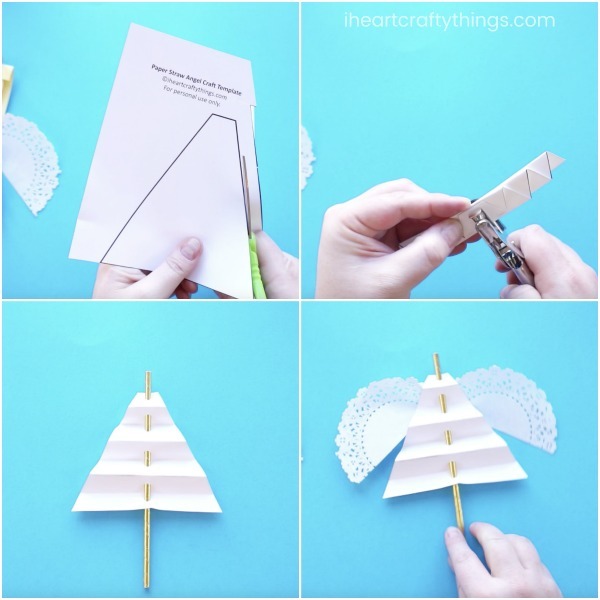 This would make a lovely Sunday school craft learning about the birth of Christ. 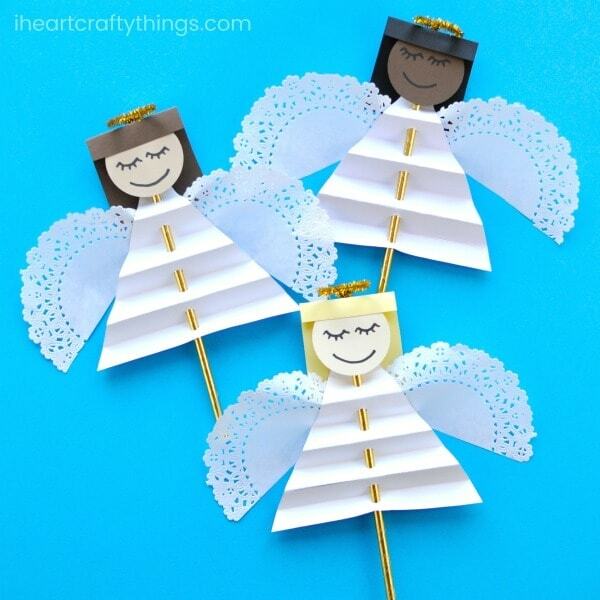 Children might enjoy flying their pretty Christmas angel crafts around as they sing Hark the Harold Angels Sing or other Christmas songs. 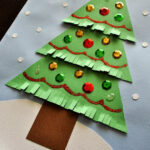 Looking for more fabulous Christmas crafts to make with the kids this year? 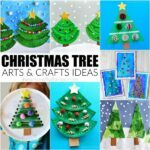 You might enjoy enjoy this darling recycled newspaper Santa Craft or this awesome 3-D Christmas Tree Craft. This paper reindeer craft is another favorite! Thank you for sharing your craft ideas. I so appreciate it!